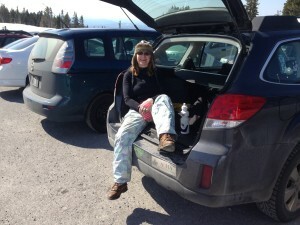 Ski grrrl in the back of the Subaru at the end of a lovely spring bluebird ski morning. We got up to Timberline about 8 this morning. I resorted to buying a cup of coffee in the lodge, because after chasing kids on Thursday, then canning like a madwoman on Saturday, I knew I needed something more. A 12 oz coffee with two doses of Chocolate Caramel and one dose of Hazelnut creamer worked right nice. It was clear and sunny, although there was a thin layer of brown haze that floated over the Cascades and obscured Mt. Jefferson (and we probably breathed it in as well; it was aimed at Hood too). Chinese pollution? Slash burning in the Coast Range? Hard to say. But it was in a distinct air layer and it blew on through. The snow was definitely spring snow, and Timberline had Palmer chair running. We didn’t venture up to Palmer but our only flirtation with lower levels was the short run down West Leg to Norman. Riding up, we got second chair, and I briefly flirted with the idea of a warmup run down Norman before moving over to the Mile. But as I eyeballed the snow, I made up my mind that we were going to the Mile. And it was lovely. Gorgeous spring snow. Hard, with a little softness from the grooming. No death cookies of ice up high. I thought about Palmer, and then thought about this year’s boot struggles and everything else. The Mile was good enough for today. The boots are working well. I wore my lightest socks on Thursday; washed them and wore them again today. No pinching, no tightness, and just a wonderful smooth flow between leg, boot, and ski. Afterward, we stopped by the barn and I gave Mocha her slow-mo workout. We worked on trying to get her to take a cue as to which leg to start with over a pole. Um, not there yet. But working on it. And now home, and the big computer’s messed up. Sigh. Oh well, such is life. At least I still have the laptop. Nonetheless, it’s spring, and I’m enjoying the mild weather.